Today it is gray and cold in So Cal, which is fine for a day dedicated to house cleaning and packing for the next adventure. Before tackling laundry and finding a place for this and spot for those, I will share some color from the beautiful Hamakua Coast. Colors, shapes, texture... if only you could feel the breeze and smell the guavas and fresh cut cane grass. The vine is growing strong, making a windbreak between the house and the garden shed. Such a color contrast with the orange and candy purple. I wish I knew the name of the orchids used in this amazingl lei. Geoff gave it to me for Valentine's day. It looks delicate and yet it was surprisingly heavy and sturdy. The flowers make a beautiful pattern and fit together like an origami puzzle. 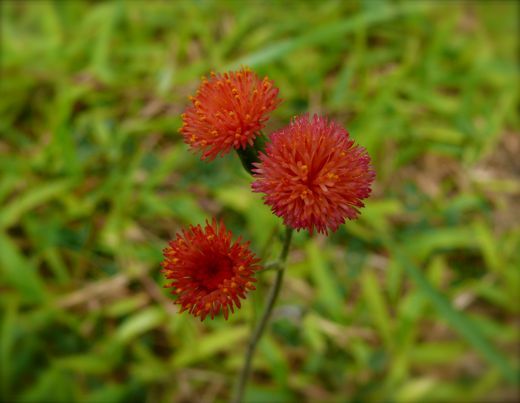 These tiny clover-like flowers were all over the lawn. The head of each blossom was smaller than a dime. 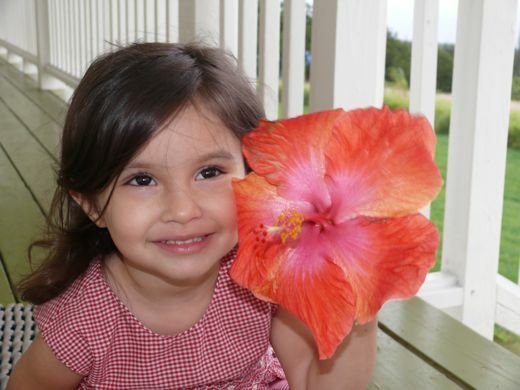 The hibiscus are much bigger... as big as a bright and smiling face. 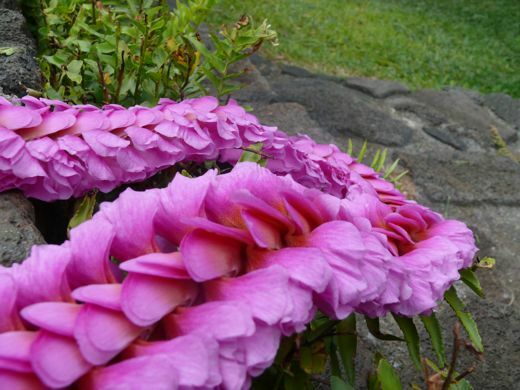 The lei lasted many days and was still lovely and fresh when I left it on the fence post... my fond aloha to this magical place. 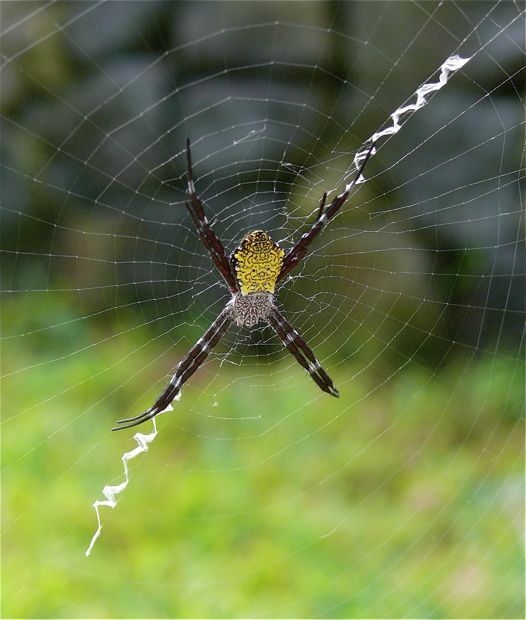 Even the spiders are beautiful, colorful and engaging, and there are no poisonous spiders in Hawaii. Some leis are made from ti leaves. I have only seen green ti leave leis. 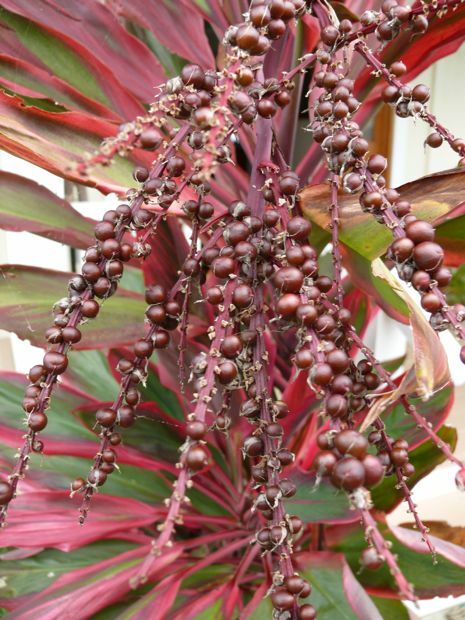 This plant would make a very special lei. No time for day dreaming now. We will be in Chicago next week, and there's lots to do until then. Natalie, the leis look so sumptuous, like they might feel like velvet. 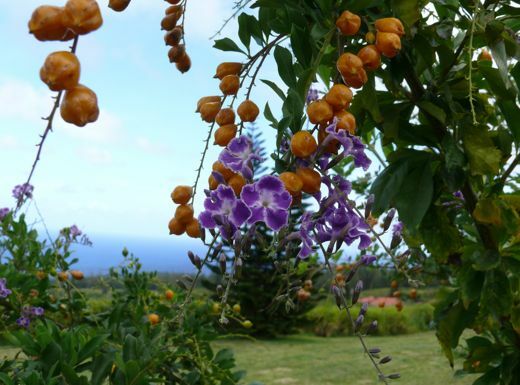 The vine you show with the yellow-orange "berries" is duranta - I have one with sweet blue flowers and wicked thorns! Cooool pictures. Giant hibiscus! 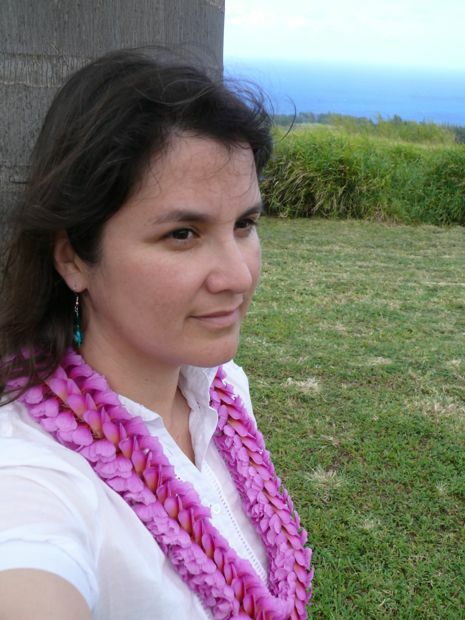 That lei IS amazing, and you look beautiful wearing it. :) Not that you don't always look beautiful, because you do! WOW, gorgeous photos. The leis are so pretty and that huge hibiscus, WOW! Illinois, you will get to play with snow this winter ;-) I bet the kids will love it! The colour in this post was fantastic! Maybe an inspiration for a colourful new quilt?? That hibiscus that Maria is holding is awesome! We don't get a lot of flowers that big in MI. 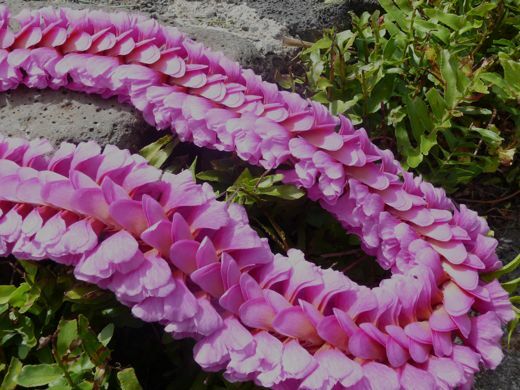 Your lei from Geoff is just a gorgeous as you are! What a beautiful color, it looks so nice with your dark complextion!! No poisonous spiders...Really??? I agree with Tarie, kind of scary, but beautiful! 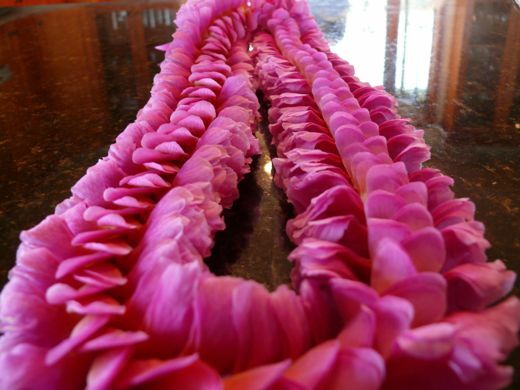 The lei is gorgeous. What a nice present. Hey -- Chicago is my hometown! Can you say what the trip is about, and do you already have your plans made? Have you been before? If I can help, just let me know -- and say 'hello' to my city for me!